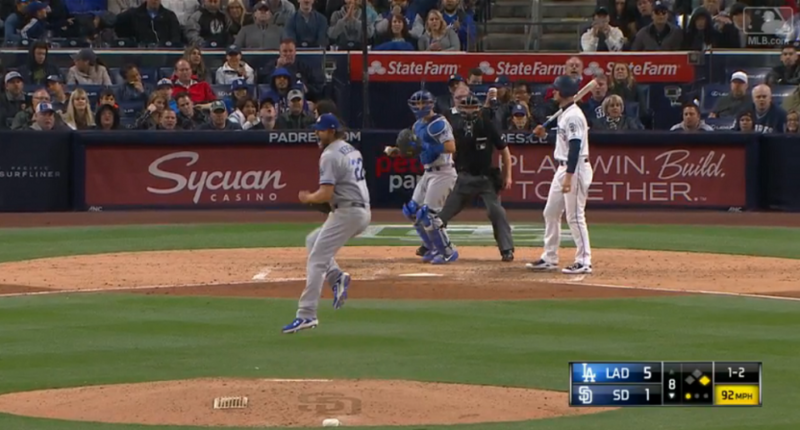 The Dodgers' ace did not enjoy Saturday night's strike zone. How do we know (the technology is) accurate? I think the umpires do a really good job, and I don’t want to see that. As much as the hitters complain at times about strike zones, the high strike would be called in that box, and that never gets called, so they would have more issues than they think, for sure. I’d like to hear if Kershaw still feels that way after Saturday night! Baseball’s best pitcher walked four Padres batters, and, well, that hardly ever happens. What should’ve been strike three on San Diego All-Star Wil Myers became ball two, and the plate appearance eventually resulted in a walk. Roberts said Kershaw (118 pitches) will get an extra day's rest before next start.